Changwon ([tɕʰaŋ.wʌn]) is the capital city of Gyeongsangnam-do, on the southeast coast of South Korea. With a population of 1.07 million as of 2015, Changwon is South Korea's 9th most populous city. A port city, Changwon is bordered by Masan Bay to the south, and the cities of Busan and Gimhae to the east. The city of Miryang lies to the northeast, and Jinju to the west. The region has been inhabited since the Bronze Age, and its urban areas have been renamed and re-organized many times throughout history. In 1974, with the creation of the Changwon National Industrial Complex, the three historically interdependent cities of Masan, Jinhae, and Changwon began to undergo significant economic development, growing into an important industrial centre. On July 1, 2010, the cities of Changwon, Jinhae, and Masan merged to form the current city of Changwon. As Korea's first planned city, modeled after Canberra, Australia, Changwon uses accessible urban planning including a large number of parks and separate residential and industrial areas. The city has also branded itself an "environmental capital" with the municipal government actively participating in climate change conferences and committing to the development of sustainable policies like the globally recognized bike-sharing program, Nubija. Populated since the early Bronze Age, the area surrounding Masan Bay would have been a wide open region between the ocean and the hilly lands of the coastal plain. Today ruins can be found in the area dating from the Iron Age. Typical Iron Age landmarks include Bangyedong monuments, dolmens, holy mounds, lower molar sites, and dolmens from Bronze Age settlements. In 209 AD, during the Three Kingdoms period, the area was named Gulja-gun, a province of the Silla kingdom. During the Unified Silla Period, this region was renamed to Uian-gun in 739 AD, during the reorganization of all Silla provinces, then in the Goryeo Period, to Uichang-hyeon. The name Changwon was first used in 1408 during the Joseon period, when King Taejong established the city as Changwon-bu. In 1415, he renamed Changwon-bu to Changwon-dohobu. Later during the King Sunjo Period (1601), it became Changwondae-do hobu. In 1895, the country was reorganized into 23 divisions by King Gojong, and Changwondae-do hobu was split into Changwon-gun and Ungcheon-gun. In 1908 Ungcheon-gun merged with nearby Jinhae-gun. During the Japanese colonial period, the city became known as Masan-bu, and Masan Port was opened. Eventually, Changwon was separated from Masan-bu. In 1970, the Masan Free Export Zone was opened to encourage foreign business to move to the area. In 1974, Changwon was selected to be an industrial and residential centre, as well as the provincial capital. The Changwon Industrial Complex was built in the south of the city, while Changwon began urban planning modelling itself after Canberra, Australia. The country's longest straight road was constructed in Changwon, with a length of 15.27 kilometres (9.49 mi), with the industrial park to the south and residential complexes constructed to the north. This road, Changwon Daero, is meant to serve as an airplane runway in a state of emergency as Changwon was designed to be South Korea's emergency backup capital city. Underground walkways are able to serve as bomb shelters and roads and buildings in the planned city are numbered for efficient use in evacuation. In 1985, the Korean War Monument (충혼탑) in Changwon's Uichang gu was constructed. The 47.1 metres (155 ft) monument is "dedicated to the 1,142 soldiers from Gyeongsangnam province that died in the Korean War." On July 1, 2010, the three neighboring cities of Masan, Changwon and Jinhae unified to create Unified Changwon City, with a population of 1.08 million. Changwon is located on the southeastern coast of the Korean Peninsula, on the Nakdong River delta looking out onto Masan Bay. The city is surrounded by mountains, the highest of which are Mt. Bulmo (802 metres (2,631 ft)), Mt. Jeongbyeong (567 metres (1,860 ft)), and Mt. Jangbok (582 metres (1,909 ft)). The city also comprises several small islands in Masan Bay and along the coast including Dot island, Sokuri island, and several uninhabited islands. The city has four distinct seasons. The average temperature ranged between 2.8 °C (37.0 °F) in January to 26.5 °C (79.7 °F) in August. The average annual precipitation is 1,527 millimetres (60.1 in). Between 1980 and 1990 there was an annual average of around 116 sunny days a year (32% of the year), and between 1990 and 2000 an average of 135 (37%). Changwon has 5 administrative districts (Gu) which are divided into 54 neighbourhoods (dong), 5 in Uichang-gu, 7 in Seongsan-gu, 12 in Masanhoewon-gu, and 15 each in Masanhappo-gu and Jinhae-gu. The development of Changwon into an industrial city during the 1960s and 70s has led to a city structure that is bisected by one main avenue called Changwon Daero, meaning Changwon big road. To the south are the factories, to the north are all of the residential areas. Changwon Daero also serves as emergency runway for military purposes. The Financial district is located in the southern part of Jungang-dong and Sangnam-dong, while the government district located northern part of Youngho-dong and Shinwol-dong. The Changdong Art Village has many murals and artwork on display throughout the streets. Originally Masan's old town, when businesses began to disperse, "ateliers, cafés, and galleries took over the vacant stores" transforming the area into a thriving art district. The Sangnam neighborhood is the central part of greater Changwon. The main part of this neighborhood, the Sangnam Commercial District (상남상업지구), is the main nightlife area, with many bars, hotels, business bars, noraebangs, and restaurants. On every day of the month with a date that ends in 4 or 9 the market "Sangnam-sijang" is open and bustling for business. This is the largest farmer's market within the city, with vendors selling fresh seafood, vegetables, and other groceries as well as clothing and pottery. There is also a large-scale residential complex of high-rise apartments. Jungan-dong, located just west of Sangnam, is the "old town" and extended central area of the city. There is more nightlife here than restaurants, and local English speaking expats often frequent the area for drinks and laughs, often living very nearby. This is the most likely place to meet one of the foreign English teachers, engineers and armed services residence of the area. Changwon city owes its rapid growth since the 1970s primarily to the Changwon industrial Complex, a 25,302 km2 hub of factories dominated by heavy industry which employs 82,000 and leads the chemical, industrial, and heavy machinery sectors of the Korean economy. In September 2010, the Changwon Industrial Complex exceeded 2,000 tenant companies. The tenants are 97.8% (1,957) small-to-medium—sized businesses, while large corporations make up 2.2%(44) including Samsung Techwin, GM Korea, LG Electronics, Hyundai Rotem, Doosan Heavy Industries & Construction, Doosan Infracore, Hyosung, Hyundai Wia and STX Corporation. As the provincial capital, Changwon is home to several government offices, and the Jinhae-gu district contains a large naval base housing the Republic of Korea Navy. Changwon's Gross Regional Domestic Product is 21.7 trillion won which is higher than that of Gwangju and Daejeon. It earned 29 billion dollars through exports in 2008, more than Busan, Gwangju, Daejeon or Daegu. There are 46 high schools, 63 middle schools, 105 elementary schools and 193 kindergartens in Changwon, including two special-purpose high schools: Changwon Science High School and Changwon Mechanical Technical High School. Although a growing divide between Changwon's vibrant, modern west side and its older east side, has been identified as a source of socioeconomic and health inequality among its citizens, Changwon's municipal government has responded with renewed commitment to ensuring the social determinants of health for all citizens. Changwon's Healthy City Initiative has undertaken several initiatives to promote better health including the implementation of a bike-sharing system, "the development of walking trails in apartment complex areas" accessible to 85% of its citizens, building a new publicly-funded health centre in the east side, anf the installation of defibrillators in public areas like shopping centres and apartment complexes, giving Changwon "tremendous potential as an international model" for cities wishing to encourage public health. The Samsung Changwon's Hospital's Regional Emergency Medical Centre, the region's has been ranked as Gyeongsangnam-do's top emergency medical centre. As a planned city, Changwon was built to include more natural space than many other cities in Korea including dozens of parks, gardens, trails, and plazas throughout the city. The city is also located on the coast, making it home to several beaches. Some well known Changwon parks include Jinhae Dream Park, an ecological reserve; Junamjeosuji, a reservoir and bird sanctuary; House of Changwon, a hanok village and education centre; and Changwon Marine Park on Dotseom Island. Changwon is also home to the Changwon Exhibition Convention Centre (CECO). K-Pop World Festival: a yearly singing and dancing competition in which contestants from all over the world perform live cover versions of K-Pop songs. 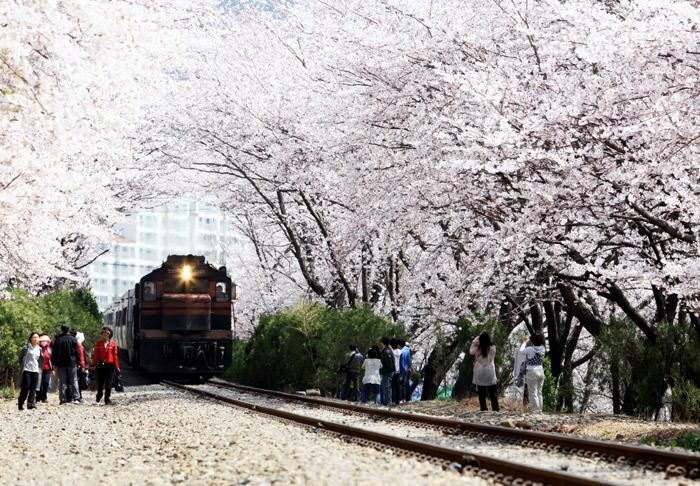 Jinhae Gunhangje Festival: a yearly 10-day event beginning on April 1, which features cherry blossom viewing, fireworks, concerts, a parade and performances by international Military Bands & Honor Guard . Warty Sea Squirt Festival: a seafood festival held in April to celebrate the local mindeodeok and featuring a fireworks show. Changwon Namsan Sangbongje Festival: a gathering held the weekend after Chuseok when locals gather on a mountain to perform an ancient harvest ceremony and drink, sing, & dance with their neighbours "as a way to seek the Chuseok traditions of our ancestors". Jillyesanseong Fortress Royal Azalea Festival: a flower viewing event held at an historical fortress on Bieumsan Mountain during the blooming season of Royal Azaleas. Changwon hosts four professional sports teams: a basketball team, two association football clubs, and a baseball team. The city also hosted a Formula 3 race, the Korea Super Prix, from 1999 to 2003. Per capita, Changwon has one of the largest foreign populations in South Korea, largely due to the Masan Free Trade Zone, which was created to encourage foreign business to move to the area, the Korea Naval Base in Jinhae, which houses numerous American military professionals, and the prevalence of English academies known as hagwons throughout Korea which frequently employ teachers from a variety of English-speaking countries. 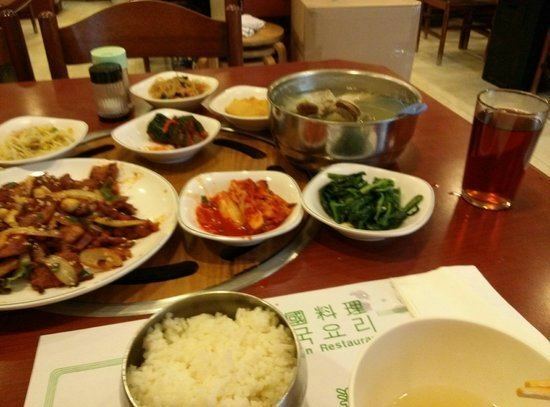 Changwonderful, a website created by two foreign residents of Changwon, was created in 2012 as a resource for those traveling and moving to the city from abroad, with a goal to "not only ease foreigner life in Changwon, but also strengthen ties between foreigners and the local community." The website encourages reader participation in content creation and provides information on local business, attractions, culture, and infrastructure. The Changwoner, a podcast with over 50 episodes as of 2017 and hosted by three foreign residents of Changwon, represents another project by foreign residents of Changwon to promote the city and build a common culture between residents, visitors, and ex-pats living in Changwon. The Changwoner also has a social media presence on YouTube, Facebook, and Twitter. Changwon, having been the first city in Korea to declare itself a cycling city, is now considered "one of the world's leading cities in terms of its public bicycle system". The Nubija bike sharing system was introduced in 2008 in an attempt to alleviate traffic and parking issues, encourage public health, and move away from car-dependent models of urban planning. The bike-share program also included infrastructural changes to the city, including 18 new bike lanes spanning 100.8 kilometres (62.6 miles), giving Changwon Korea's largest public bicycle rental system. As of 2012, Nubija had 4,704 bicycles available at 241 terminals throughout the Changwon area, which can be searched for using the Nubija app. Users access the bicycles using a small chip called a MyBi pass. Nubija had over 68,823 registered users in 2012, and rented an average of 15,850 bicycles per day. The name Nubija comes from the Korean words nubida, which means “to travel” and jajeongeo, which means “bicycle." As a planned city, Changwon "utilizes a grid style infrastructure which makes transportation more efficient than other cities of comparable size". Changwon and the surrounding area are served by over 80 city bus and express bus routes. Express and Inter-city buses connect Changwon to other cities throughout Korea from six bus terminals throughout the city. The city is on the Gyeongjeon Line (Gwangju-Samnangjin), which stretches along the southern coast and links the Jeolla and Gyeongsang regions feeding local traffic into adjacent major lines. 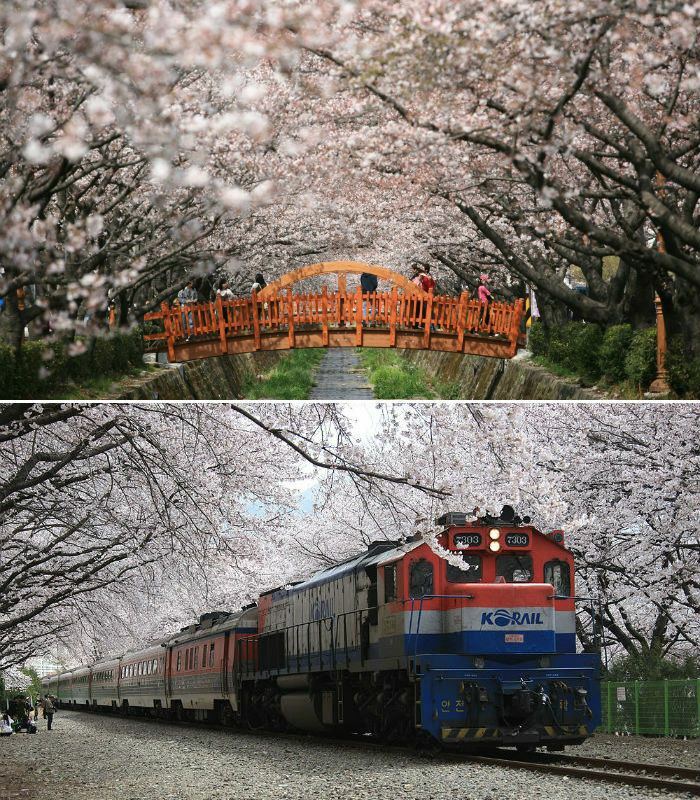 As of 2010, KTX trains began running from Changwon to Seoul; travel time is approximately three hours. Masan Ferry Terminal offers service to the city of Geoje to the southeast. 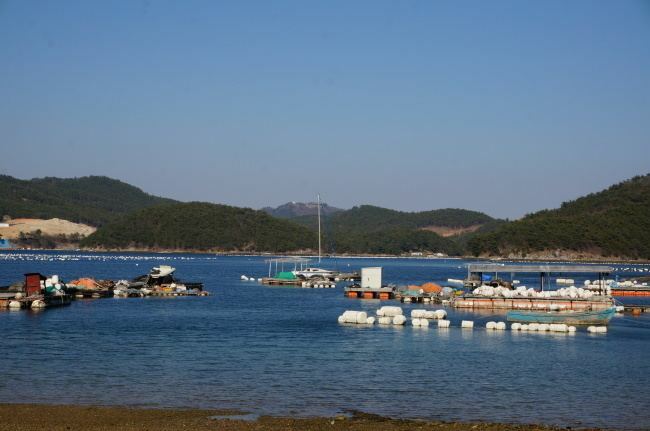 At Masan Dotseom Marine Park, a 10-minute ferry is available to Dotseom, a forested island in the centre of in Masan Bay. Gimhae International Airport (PUS) is the closest airport, 35 kilometres (22 miles) east of Changwon in the city of Gimhae. In 2016, the airport was the 4th busiest in South Korea, with 14,900,815 passengers passing through. Changwon's municipal flag depicts a tri-coloured pinwheel made of 'C' shaped wings. The white space between the wings forms the image of three people holding hands and spinning in unity, balance, and harmony. The three colours of the pinwheel are: blue, symbolizing the ocean, growth, and hope; orange, which represents the city, passion, and creation; and green for nature, life, and balance. The official city mascot of Changwon is PIUMI, a childlike figure with a blooming flower on its head, representing the cities famous cherry blossoms. The city's slogan, 빛나는 땅 창원, means "Bright Changwon." Changwon has several international sister cities around the world, as well as designated "Friendship Cities"